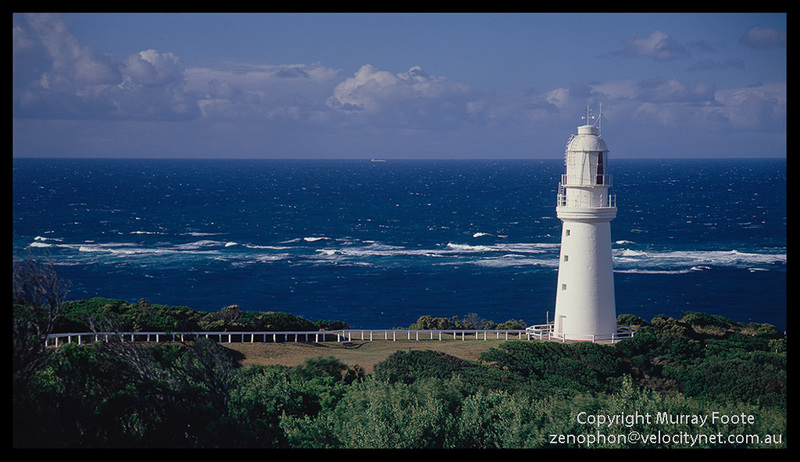 Cape Otway is on a headland south-west of Melbourne and is approximately north of the Cape Wickham lighthouse on King Island. It safeguards one of the main maritime approaches to Melbourne. I visited on 20 and 21 April 1987. One of the early keepers, Henry Bales Ford, stayed at Cape Otway for thirty years, from 1848 to 1878. In the early years supplies could be less than adequate and they were delivered every six to twelve months only. Probably not surprising over a thirty year period, there were several instances of conflict between Ford and the lesser keepers. The tower is eighteen metres high. It did not need to be very high because it sits seventy metres above sea level. The railings and view. This is really a bit of a warm-up exposure with not as compelling a composition as the following image, taken a few minutes later. It’s taken on 35mm film rather than 5×4 sheet film and the process is a lot less deliberate. Just a lower viewpoint and adjustments in framing produces quite a different effect. 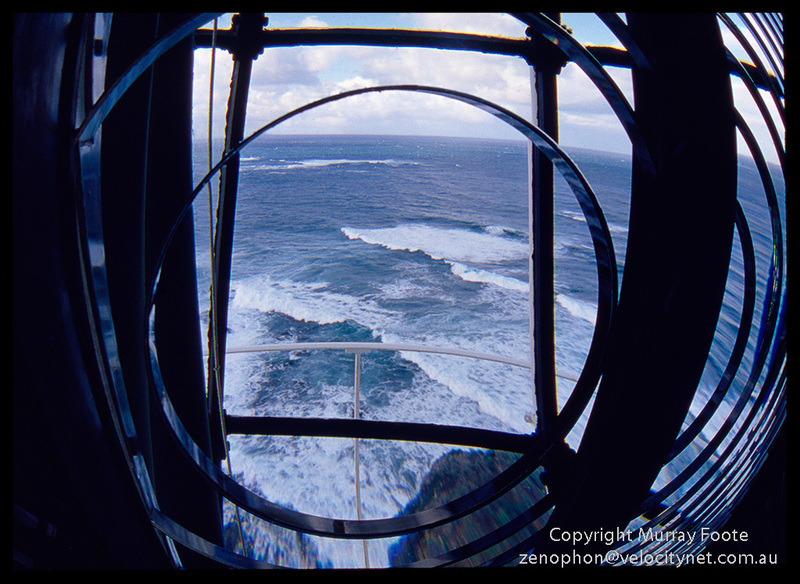 A view through the lens showing a logical inconsistency that those who have read through the lighthouse posts should notice readily while those who have just come in to this post are unlikely to notice at all. Well, it’s upside down. 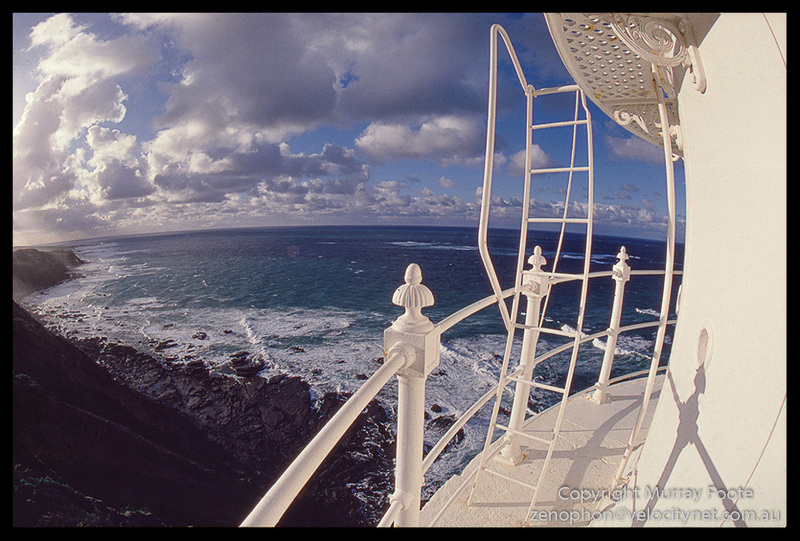 Like a lens in a camera (or the human eye for that matter) the lens of the lighthouse makes the outside world appear upside down and back-to-front so the image itself is upside-down to make the waves appear the right way up. 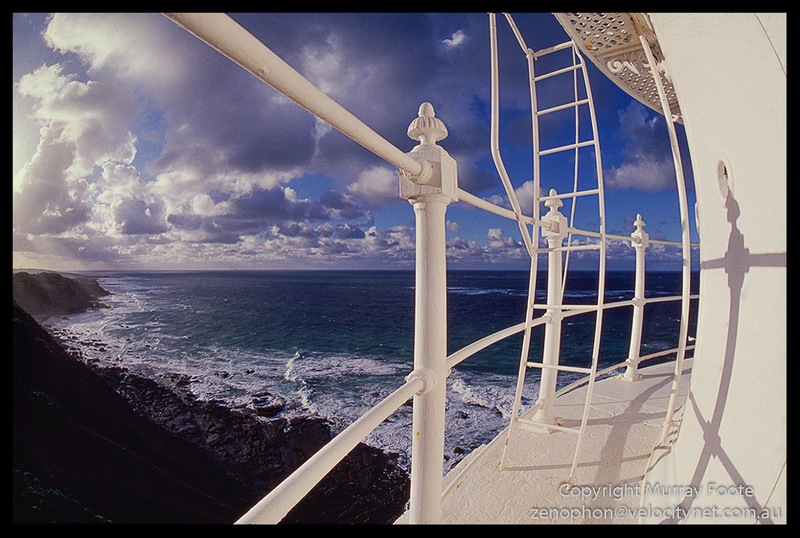 This entry was posted in Australia, From Dusk Till Dawn and tagged Architecture, Australia, Cape Otway, History, Landscape, Lighthouses, Photography, seascape, Travel, Victoria. I think I have visited this light house. it was sunset and beautiful. I think it was featured in the show Round the Twist that I use to watch as a kid. I don’t remember that show but it’s definitely a memorable lighthouse.